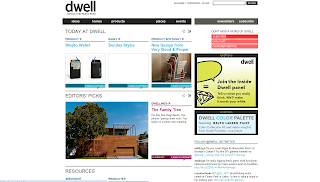 An interior design site to compliment the monthly magazine. With a self proclaimed 'nice Modernist' take on design, this site offers photos of beautiful homes, ideas, products, profiles and interviews with architects and designers, reviews of cities and places around the world, and events of interest from sales to exhibitions. Sign up for one of the following newsletters as well: a magazine sneak peak, special offers, trade events, and the most clicked-on content from the site.